Technology is a powerful tool to engage and empower our students. 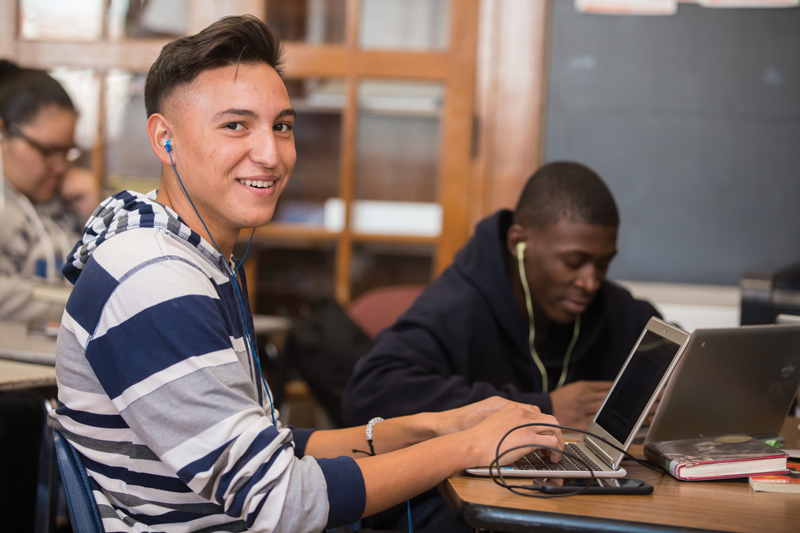 With the approval of the 2016 DPS Bond and Mill Levy, we have embarked on an initiative to shift schools in grades 6-12 to a one-to-one computer device that students will be able to take home. MyTech was designed based on research indicating that student outcomes improve when the one-to-one implementation is thoughtfully planned and executed. Participating schools receive additional bond funding, as well as other district supports. All DPS schools receive $100 per pupil for classroom technology. Schools that have been selected for MyTech receive one-to one Chromebooks for their students using additional bond funds- bringing the total per-student investment over $300. Chromebooks were selected, purchased and distributed by the MyTech team, and schools developed their own plan for rolling out these devices to students. Digital Coach: MyTech schools receive a part-time digital coach. These digital coaches are hired, trained centrally and then and assigned to each school to help teachers integrate technology into their classrooms in order to make the most of the student devices. This half-time position is used by the school in support of their professional development plan. Participating schools also receive district support in the many aspects of a one-to-one implementation, including asset tracking, parent and student communications, parent and student agreements, kick-off planning, and resources for developing a culture of digital citizenship. Schools that serve students in grades 6-12 were invited to apply online. After scoring the initial application, schools were narrowed down and asked to participate in a deeper planning process. This planning included assistance from the DPS Educational Technology team, Department of Technology and other central resources to help schools with a successful one-to-one implementation. This included an intentional effort to align this implementation with the school’s vision as well as detailed planning around professional development, device deployment, digital citizenship and other culture development, community outreach, and success monitoring. How were schools selected to participate? The responses to the initial application were scored by a selection committee. The scoring was reviewed with the Instructional Superintendents (IS). The IS had the ability to remove schools that they strongly believed were not ready for this program. We also looked across the schools to ensure they fairly represent the ethnic and socio-economic makeup of the district. While we do not have specific percentage requirements for free and reduced lunch (FRL) students, or students of color for individual schools, we do want to make sure the entire program is a fair representation of the ethnic and socio-economic composition of the district. The steering committee and district leaders reviewed the final list of schools selected to move forward. Schools were notified when they returned from 2016-17 winter break as to whether they were moving into the next selection round. How are students using these devices outside of school if they do not have internet access at home? The bond funding does not support internet access outside of school, but we looked to community partners to identify options for providing this access. Through funding from the 1Million grant and supplemental sources, we have provided over 700 mobile hotspots to students who do not have home internet. How are schools reporting their progress? Reporting measures focus on determining how teachers are using the technology in their classroom so we can see the impact of specific approaches on student outcomes. What happened to all of the devices we were already using in our school? Decisions about existing devices were made individually in partnership with each school. In some instances, legacy devices were transferred to other schools who need more equipment. These transfers happen over time, depending on how the school rolls out their MyTech devices. In other cases, it was appropriate to leave some devices in place to support specific programs in that school. The overall goal is to use district’s assets efficiently and cost-effectively and to ensure the students in the participating school don’t take any steps backward in terms of their learning environment. Does the digital coach replace my school's technology representative (STR)? No, the digital coach role is funded centrally and is not intended to replace or support the STR. Their role is to work with teachers to effectively incorporate technology into lesson plans, assessments and student assignments. Can students provide their own devices? Because this is a pilot program in which students take home devices, we established some common processes for device tracking and management. This does not include students using their own devices in the program. We are not ruling this out as an option, however, for the future of one-to-one initiatives in the district. Are schools required to have a full-time employee dedicated to this program? A School Technology Representative (STR) is required at participating schools. This individual does not necessarily have to be full-time. Are K-8 Schools participating in this program? Yes, K-8 schools are participating. However, the program only applies to grades 6-8. How will this program be sustained after the bond funding runs out? In addition to the $300 per student for hardware, an additional $150 per student is included in the funding to refresh and/or replace devices (as needed) during the three-year period. In the detailed planning phase of the selection process, schools were asked for their vision on how they might be able to fund refreshes/replacements after the three years are over. Do all of my students receive their MyTech device in the first year of the program? No, not every student receives their device right away. The distribution and roll out of the program is up to the school. Schools may choose to roll it out by grade, by specific programs within the school, or any other method that supports their strategy. Defining the rollout plan was part of the planning process. All students in grades 6-12 should have a device, however, by the beginning of the 2019-20 academic year.